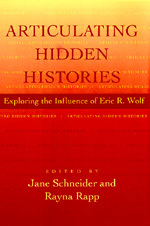 With his groundbreaking Europe and the People Without History, Eric R. Wolf powerfully advanced the project of integrating the disciplines of anthropology and history. In Articulating Hidden Histories, many of those influenced by Wolf—both anthropologists and historians—acknowledge the contribution of this great scholar while extending his work by presenting their own original field and archival research. The "hidden histories" referred to here encompass the histories of economic and political forces capable of dislodging people from their surroundings, of the people thus dislocated, and of the anthropological concepts developed to understand such processes. Within this framework, the contributors explore an extraordinarily wide range of topics, from the invention of tribalism in colonial West Africa to the ecological activism of North American housewives. This collection offers a fitting tribute not only to Eric Wolf's work, but to its continuing influence on the fields of anthropology and history. Jane Schneider is Professor of Anthropology at the City University of New York and coeditor, most recently, of Cloth and Human Experience (1989). Rayna Rapp is Professor of Anthropology at The New School for Social Research and coeditor, most recently, of Conceiving the New World Order: The Global Stratification of Reproduction (California).